Koltz, winner of the Small Vignerons Award, is a small fifty tonne winery located within the elite Blewitt Springs appellation of McLaren Vale. All wines are estate grown and crafted, the operation is very much hands on. Shiraz was the estate's first effort, produced in small volumes, from fruit grown to a small but very special block of vine. Characterized by blueberry and earth characters, elegant with velvety tannins and superb length. Extended maceration contributes to the complexity, the aim being to construct a Shiraz which reflects the excellence of site. Koltz is a very small producer of hand crafted wines, made to traditional methods, fermented in open vats, basket pressed and matured under finely grained oaks. 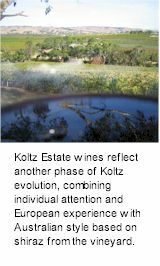 Koltz try to make wines that are individual and reflect the estate's philosophy that wines should be a pleasure to drink at every stage of their evolution. Vintage at Blewitt Springs is generally two to four weeks later than most of McLaren Vale. The sandy soils over ironstone make distinctive wines. Shiraz is open fermented and basket pressed, portions are treated to an extended maceration for up to fifty days, depending on season and ripeness. The finished wine is matured in a selection of seasoned and new French oak barrels for up to twenty months. Deep vibrant dark purple colour. Lovely berry fruit pastille characters with a touch of spice supported by subtle cedary oak. A middle weight wine with a soft generous mid palate finishing over nice firm tannins. Mouthfilling, a lift of spicey fruit carries through from the nose. Excellent value for the Koltz entry point wine, there's plenty to appreciate in this pure and ripe, well crafted, concentrated Shiraz.